What a weird, wonderful, magical thing this Where the Wild Things Are movie is. What a strange and beautiful ode to imagination and childhood and the heartbreak that makes growing up so troubling. What a fabulous tribute to the creative powers of Maurice Sendak and a confirmation of the near genius-level skill of Spike Jonze. How I'd kill to be eight years old again and be able to see this movie with those eyes, and yet how every eight-year-old should kill to be me and watch Where the Wild Things Are with the blessing of age and knowledge so they could see just how deep this movie goes. The original story from the Sendak-penned children's book should be familiar to all. Max, a troublemaking and troubled child prone to wearing wolf's clothing, sails the ocean wide to a secluded forest where giant creatures live. They have huge heads and fur and horns and feathers, and they adopt little Max as their king. He frolics with them, indulging in the kind of behavior that got him in trouble back home and sent him scurrying into the wilderness in the first place. Before long, though, he begins to yearn for the comforts of regular life, and he returns to a warm meal, not necessarily changed, but more appreciative. The book Where the Wild Things Are would seem slight material for a full-length movie, but director Spike Jonze (Adaptation) and his co-writer Dave Eggers (the journalistic novel Zeitoun, the movie Away We Go) have taken Sendak's tale as the starting outline and filled in the spaces between the pages to find the hidden meaning in the author's world. Their Max, played by the young actor Max Records, is the product of a broken home. He is a boy full of conflicting emotions, living with his mother (Catherine Keener) and sister (Pepita Emmerichs). He likes to play and tell stories and act crazy, but he also gets angry and has tantrums and feels isolated. When his mother brings home a new boyfriend (Mark Ruffalo), Max has a fit and runs away, dressed up in his wolf pajamas. He finds a boat and is soon far away, landing on a distant shore. Where the wild things are. This new landscape Max finds himself in is one where emotions are writ large. There is the tender but impulsive Carol (James Gandolfini), the selfish and pessimistic Judith (Catherine O'Hara), and the shy and ignored Alexander (Paul Dano). There is also K.W. (Lauren Ambrose), a tenderhearted female creature that does all the things for Max that the boy thinks his mother and sister failed at. She sticks up for him, shares with him, and protects him. There are actually a lot of wonderful little echoes from the real world in the forest. The events that lead to Max's outburst are replayed here, but with different consequences and more for Max to witness rather than experience. Seeing his own out-of-control behavior parroted back at him causes Max to reflect on what he's done. Not that it's all so serious. Jonze crafts many a fun, anarchic sequence, with Max and the wild things running through the woods, having a dirt war, and building a giant fort. The world that the director and his team create is marvelously self-contained and entirely believable. 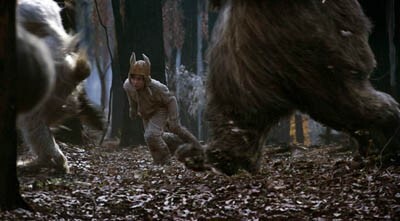 The wild things are played by actors in large suits designed by the Jim Henson Company, like versions of Sweetums from the Muppets enhanced with more animatronics and a little CGI facial action. This allows them to jump around and play with Max, and he can grab their fur and climb on them and have it be wholly real, not some digital trickery. Smartly, Jonze has mainly hired character actors as the voices for the creatures (other members of the tribe include Chris Cooper and Forest Whitaker) so that we aren't distracted by the obvious personalities behind the performances. Granted, you may spend some of the movie trying to pinpoint where you've heard those tones before if you don't commit the cast to memory before going in, but it's not as distracting as it could have been if Jonze had cast Ray Romano and Jada Pinkett-Smith and the other usual suspects. Where the Wild Things Are is crafted with a light touch throughout, from the spare art direction to the almost underused Karen O. and Carter Burwell soundtrack. Rumor has it that Warner Bros. originally balked at the darkness of the picture, but whatever permutations it might have gone through, it came out of the wringer with the right tone intact. Yes, the film is as sad and angry as it is light and happy, but that is something that will only bother parents that have forgotten what it's like to be a kid and not the kids who are somewhere around Max's age. Growing up can be very confusing. Children feel helpless and unable to express themselves, particularly when the adult world can seem as out of whack as it does when a family has split. Some of the best children's films have kept this in mind, including The Little Prince, Charlie and the Chocolate Factory, and Into the West. Children don't mind being scared, and they like seeing their own problems illustrated for them. Not every movie has to be frenetic and overly colorful the way most test-marketed kids entertainment is these days. Sendak, Jonze, and Eggers have created a complete, immersive world in Where the Wild Things Are, one a child can lose him or herself in. More importantly, they manage to relate to children on their level without talking down to them. The movie is childish without being stupid, intelligent without being tedious--which is why adults can love it, too. 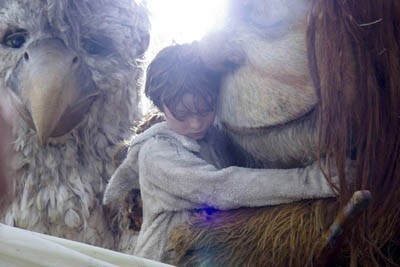 Where the Wild Things Are is extraordinary filmmaking. You've never seen anything quite like it, and I doubt it's something that can be recreated or copied. It is that special, that singular and unique. It's one you must see right now, and one you will watch again and again for many years to come. In the days since seeing it, I have thought of little else. I hesitate to brand it a classic already, as only time can tell for sure, but it is a truly a marvelous cinematic achievement, one that I can't foresee being lessened by time or its shifting standards. Wherever the wild things are, whenever they are, that's where you'll want to be, too. Buy tickets to "Where the Wild Things Are" now!